On 22 October 2018, Sovcomflot crude oil tanker Gagarin Prospect, operating on LNG fuel, successfully completed her voyage across the Baltic and North Seas from Primorsk to Rotterdam where she safely delivered a cargo of 104,815 tonnes of crude oil, Sovcomflot says in a press release. For the pioneering vessel, it marked her first export delivery of Russian crude oil under a long-term time-charter contract between SCF and Shell. 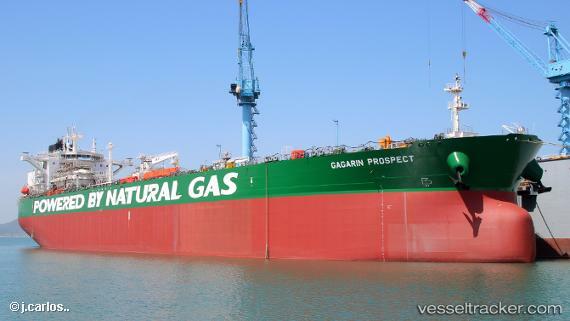 Gagarin Prospect is the world’s first Aframax crude oil tanker designed to operate on LNG as the primary fuel. She is the lead ship of the next generation of tankers, which will set a new standard of navigation safety and quality. Switching to cleaner-burning LNG fuel allows Sovcomflot to significantly reduce its impact on the natural environment. This is particularly important for ships in high-traffic areas such as the Baltic and North Seas where these ‘Green Funnel’ tankers will primarily operate.